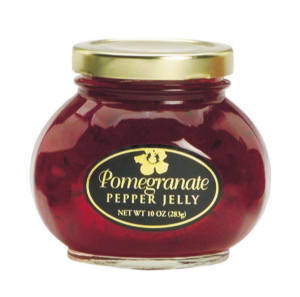 Pomegranate Pepper Jelly is an incredible new flavor! Rose amber in color, & full of fresh pomegranate, this pepper jelly is bursting with flavor. Use this pomegranate pepper jelly as a glaze, serve over cream cheese, or warmed brie with crackers, or simply make your favorite peanut butter & jelly sandwich. Aloha From Oregon Pomegranate Pepper Jelly. Serve any of Aloha From Oregon selected pepper jellies over cream cheese or warm Brie and crackers. Warm any flavor of pepper jelly & use as a taste-tingling dipping sauce for shrimp, chicken wings, strips or tenders. Toss pepper jelly with hot grilled or steamed vegetables & steamed rice for a side dish. Add to stir-fry for a spicy/sweet flair. Add a few spoonfuls to a pot of baked beans. Mix with softened butter, chill & serve on warm corn bread. Glaze meat or fish while grilling. Make a spicy peanut butter & pepper jelly sandwich.